Olympic Delivery Authority Residency – Neville Gabie, how did it go? In 2010, I was shortlisted to be Artist in Residence for the Olympic Delivery Authority. It was an achievement to have gotten that far since the brief didn’t really invite applications for dance-based artists but having the support of Dominic Campbell was a great asset in getting our application to the final reckoning. We weren’t successful but I have been delighted to follow the work of Neville Gabie who was the successful artist. His residency and the film-based work he produced is documented on his website GreatLengths2012. 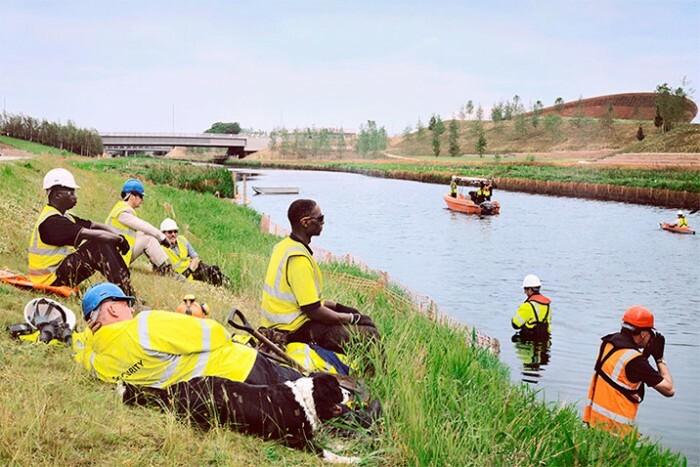 I particularly enjoyed his film Twelve Seventy for which he arranged for Olympic Park bus driver and committed swimmer Sema Yusuf to swim the 1270 metres of her usual bus route in the newly completed Olympic pool. His Seurat-inspired Freeze Frame is fun too. Freeze Frame has an immediate appeal that earned it coverage in the London Metro but Gabie’s Unearthed, that documents the history of the Olympic Park area as a site for artists’ studios tells an important narrative that counters the dominant description of the site as a former toxic brownfield ‘rescued’ by Olympic development. An article in the Guardian explains some of the challenges that Gabie encountered retaining his artistic autonomy in the ODA residency. It’s inspiring to see what he has achieved, just as it’s important to recognise the challenges that artists face and hopefully offer when they place themselves in contexts such as the Olympic Park development and the political and commercial forces that the Park represents. Now, how can we make sure dance is recognised as an art form that is an effective medium in such contexts?